Well, this thing really crept up on me. 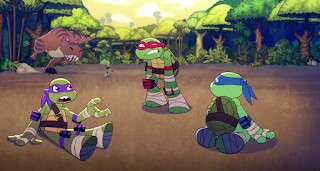 But over at AIPT I have my review of TMNT Half-Shell Heroes: Blast to the Past, an original one-hour TV special. It's aimed at younger kids, but the 2-D animation provided by Titmouse is actually really good and the comedy is pretty spot-on. Mostly physical humor, but that's where the lively animation helps. Also, lots of Bebop & Rocksteady, if that's your thing. Sweet. I had basically dismissed this when I hear about it but then had a second thought. What a perfect way to introduce my 2 year old to the TMNT! 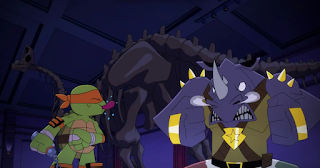 After seeing the Season 3 finale, I admit I'm actually in the mood for Bebop and Rocksteady channeling their 80's comedy relief characterization. So, I'm definitely game. Of the 87-era Cave Turtle figures, I actually do remember that and have the Leo variant. I don't have the others, I don't think, as I somewhat tuned out the series after it phrased out the side villain and hero characters or anything post-Scratch, but I did -- and still do -- like Leo, so had to get that. I haven't seen the special yet, so I really appreciate you capping that, Mark. I even had a weird nostalgic thrill at Bebop's Turtle shoulder pads. Including the upcoming toys, as I didn't think Super Deformed/Super-Cute figures of Slash and Baxter-Fly could exist, but I'm so glad to be wrong.